Gekkobrain | SAP HANA code migration | SAP Performance Optimization and DevOps – Our SAP DevOps and APM cloud technology tunes SAP performance and automates HANA migration by optimizing custom code, providing faster development cycle and providing you unprecedented insight into how ABAP is performing in the productive environment, so you save thousands of hours on troubleshooting and root cause analysis. Gekkobot never sleeps, is never sick, never takes a holiday, never bothers you unnecessarily but lives and breathes to monitor your SAP system and prevent downtime or performance issues. The Gekkobot monitors more than 2,500 data sources, works about a million times faster than a human being and will either solve your problems automatically, tell you how to solve them or migrate you to HANA. 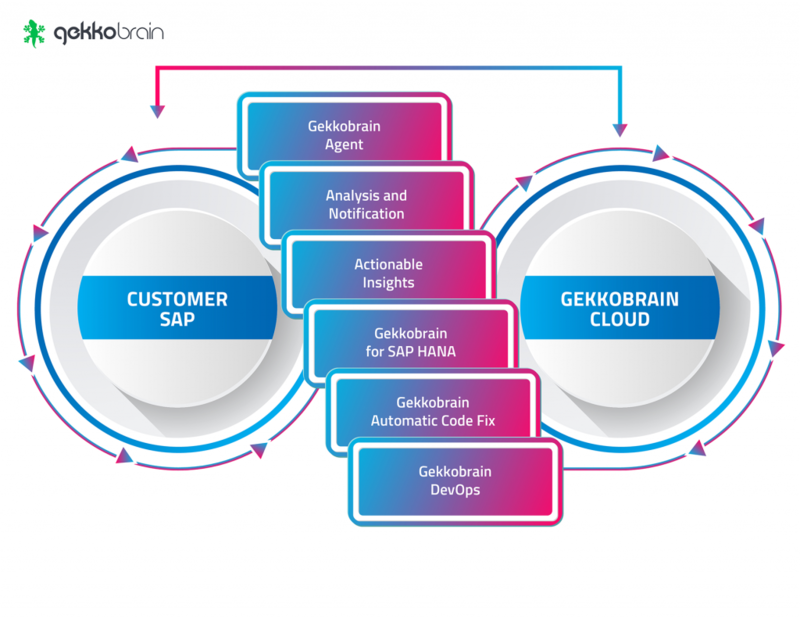 Gekkobrain connects to SAP via an agent, analyzes your code and correlates with productive data to assess impact in order to present only relevant problems and provide automatic fixes or suggest changes. Gekkobot can work in the cloud, on-premise or both, and its salary is paid back in the first month. Oh, and Gekkobot can start in 1 week with a termination clause of only 1 month. Any reason not to hire Gekkobot? Gekkobot helps your developers understand how their programs perform in production. So right from the offset, they know how changes to the program will affect overall SAP performance. It also shares relevant information with the technical team leaders, so they communicate better with outsourcing vendors. Custom code quality is not a wish, it’s a tangible and measurable objective. Gekkobot checks the code to see if it’s good, it peeks into the productive system to see, whether it performs as anticipated – or whether performance changes over time. And if anything important doesn’t look right – it will let you know and in most cases tell you how to solve it. Want to see Gekkobot in action fixing problems with Web Apps? Since Gekkobot knows code better than probably any ABAP developer in the world, it also knows how to prepare the code for HANA. So Gekkobot will analyze your current custom code base in less than a few hours, irrespective of whether you have 1,000 lines or 10,000,000 lines, and find all the relevant HANA issues and filter all those away, that don’t have an impact. Then without further ado, it will fix the relevant issues. So far, Gekkobot has fixed on average 99% of the relevant mandatory issues and 95% of the relevant performance related issues for our customers. This saves you approximately 99.5% (give or take) of the manual work involved in a Business Suite on HANA migration. Gekkobot is designed to help monitoring and improving SAP performance, and this is relevant for a whole host of companies and people. It can provide value to a company using SAP, since at the end, they suffer the most, when SAP is not responding as it should. Gekkobot makes the life easier for ABAP developers, for technical team leads and for operations leads. Where human beings find SAP complex and love easy, Gekkobot finds SAP simple and love complicated. To you, Gekkobot simply makes SAP transparent. See global retailer JYSK explain how they use Gekkobrain DevOps for SAP. Gekkobot also provides value to AMS or MS vendors. If a company is responsible for the operation of SAP, it makes sense to have Gekkobot stand sentry and keep an eye on all customers’ systems 24/7. And more often than not, performance issues are not down to servers, CPU or memory – they are rootet in bad custom code. And as an AMS or MS provider, it’s nice to be able to show the customer, what they are doing wrong and how to improve it, so SAP runs better. Not to count the thousands of hours saved in troubleshooting and root cause analysis. And finally for the companies that make money, doing ABAP for SAP customers, Gekkobot is a valued collague. Either these companies simply do just the programming or they participate in the functional and technical specifications. But in both cases, having Gekkobot around to tell you, how all other modules – including the ones you plan on using – are performing makes a lot of sense. And when the coding is done and the code submitted, it’s nice to know even before transporting to production that it will actually run perfectly in SAP. Gekkobot improves SAP performance, boosts developer productivity, manages quality of outsourcing vendors and provides unprecedented clarity. 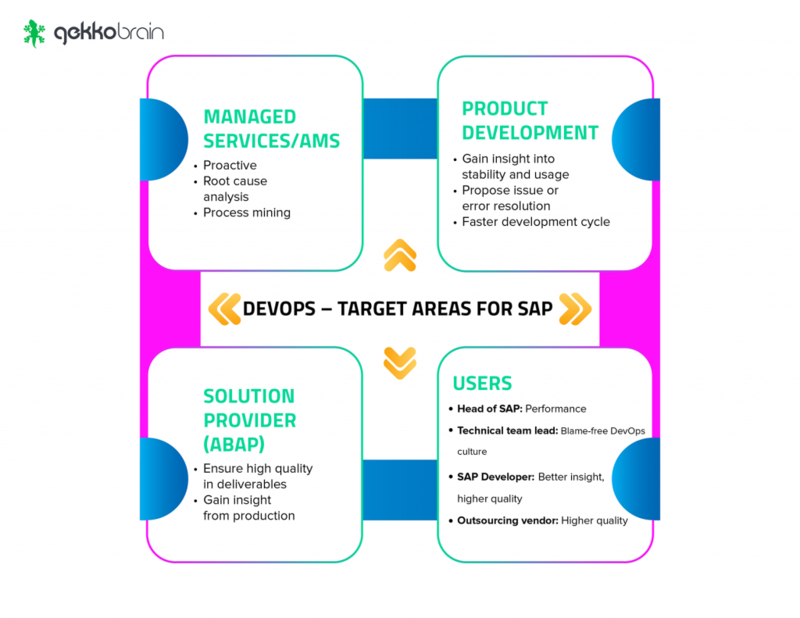 Understand and improve your SAP experience with our tuning and DevOps products. Read more about our products for SAP performance tuning. Gekkobot provides fast, efficient and automated migration to SAP HANA. Gekkobot will fix more than 95% of all code issues automatically and migrate SAP systems to HANA at fixed priced and time frame. Read more our products for migrating to SAP HANA. If you decide to hire Gekkobot, you are not alone. We are proud to have Gekkobot work for a number of quality-conscious clients and to have successfully helped them optimize SAP performance or migrate to SAP HANA. Click on the logos below to see how we and Gekkobot have helped some of our customers. Interested in improving your SAP performance? Request a free demo of our products by filling in the form below. We will respond within 24 hours. Keep up to date with the latest blog posts from our expert team. Or click here to view all.